Admission is only indicated at an institution with HBO capability. Residual paralysis, myocardial necrosis, and other ischaemic injuries may occur if recompression is not carried out immediately. These may occur even in adequately treated patients. Early symptom recognition and its acceptance prompt diagnosis, and appropriate treatment are keys to a positive outcome with all DCI. With these, a success rate of greater than 75-85% can be achieved. Patients with joint pain, skin or lymphatic DCI who have completely resolved all symptoms after recompression can fly 24 hours after exiting the chamber. Patients with neurological or multisystem DCI who have complete resolution with their first treatment should not fly for 72 hours after recompression. If a longer recompression than a Table 62 has been used then 72 hours is the limit. If there are still residual symptoms after finishing treatment then 72 hours is the limit and then only after consultation with a diving medical specialist. 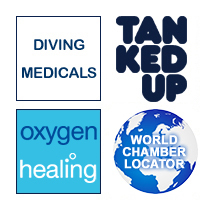 Divers who have had a successfully treated pain only DCI can return back to the water from 7 days after treatment has finished subject to the agreement of the treating physician, We do recommend that the original guidelines are for fit Naval divers, and we suggest that in others that they leave diving for at least 4 weeks after treatment of mild DCI. Divers who have had mild tingling or numbness, fully treated on a Table 62 should wait for at least 4 weeks after recompression. This is the time, though, for Sport divers, professionals could dive again after 14 days. If there has been incomplete recovery after initial recompression, or the DCI was more serious there should be a minimum period of 4 weeks off for fit professionals and 6 weeks for Sport divers. Return to diving should again be subject to the advice of and agreement with the treating physician who will be able to explain the long-term risks. If there has been a serious AGE there may be doubt over whether a diver should ever dive again, and that decision should be left to a diving medical specialist.